During the postwar period, there was much development in the field of small arms ammunition. The Soviet Union actively participated in these developments, following both mainstream and some more or less unconventional routes. The mainstream developments are well known and included 7.62x39 M43 and 5.45x39 M74 intermediate ammunition for assault rifles, as well as 9x18 ammunition for pistols. Of course, there was much more development along these lines than might appear at first sight, but for now we will focus on rather more interesting types of ammunition. The first experiments were conducted using standard 9x18 cases, but the ammunition, designated SP-1 (Spetsialnyj Patron 1 – special cartridge 1), never achieved production status. The SP-2 ammunition, which was the first to be produced in any quantity, has been based on 7.62x39 case, slightly shortened and fitted with round-nose 7.62mm bullet (most probably similar to one used in 7.62x25 TT cartridges). Internally this cartridge contained a small charge of propellant behind a two-stage telescoped piston, which propelled the bullet out of the case when fired and then locked the hot powder gases inside the case. The resulting sound was almost non-existent, and the cartridge was adopted by the KGB for clandestine operations. 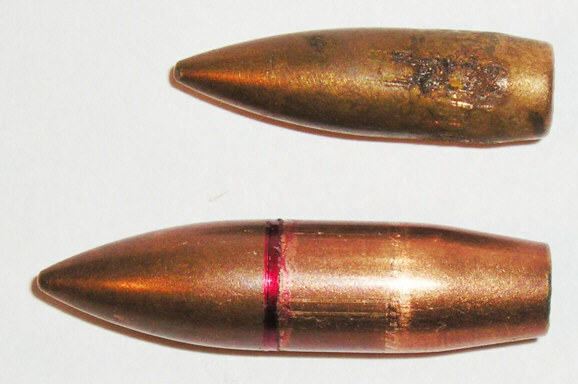 To improve performance and somewhat confuse possible investigators, the round-nose bullet was later replaced by a standard pointed 7.62mm bullet originally used in 7.62x39 M43 ammunition. This cartridge, designated 7.62x38 SP-3, has been in use since the early 1970s, along with the MSP two-barreled derringer type pistol and NRS-1 scout shooting knife. While the SP-3 cartridge was more or less adequate for the clandestine work of the KGB, it was far too underpowered for use by elite Spetsnaz units, which were supposed to operate deep behind enemy lines. To provide the Spetsnaz with a more potent weapon, Soviet designers developed an enlarged version of the SP-3 cartridge, initially known as PZ, which latter involved into the PZA and PZAM 7.62mm silent cartridges. Used in the S-4M “Groza” (Thunderstorm) two-barreled break-open pistol, the 7.62x63 PZAM cartridge has a very strong, thick walled, slightly bottle-necked case with a two-stage telescoped piston, similar to the SP-3. It is loaded with the same 7.62mm pointed M43 bullet. It has been used by Soviet Spetsnaz forces in Afghanistan. The key problem with the SP-3 and PZAM ammo were their telescoped pistons, which projected significantly from fired cases and thus made almost impossible to develop semi-automatic weapons for these cartridges. During the late 1970s and early 1980s Soviet designers solved this problem by developing the 7.62x42 SP-4 ammunition, which used the same basic principle. The telescoped two-stage piston was replaced by a single-stage piston, which did not project from the case when fired; the standard 7.62mm M43 bullet has been replaced by a cylindrical bullet, made of mild steel, and fitted with a brass driving band at the front. This cartridge was adopted circa 1983 by the KGB and Spetsnaz elements of the Soviet Army, along with the six-shot, magazine fed, blowback operated, semiautomatic PSS pistol and the single-shot NRS-2 scout shooting knife. The SP-4 ammunition and PSS pistols are still in use by elite Spetsnaz units within Russian armed forces, as well as by some FSB and MVD elite units. Apparently, the earlier MSP pistol with SP-3 ammo and SP-4M pistol with PZAM ammo were not phased out of service and still can be encountered in the hands of serious operators, who not require multi-shot capabilities of PSS / SP-4 system. The next line of development, also initiated by Spetsnaz requirements, also involved silenced weapons, but in more powerful form. Since the effective range of silenced pistols is severely limited, scout and Spetsnaz elements of the Soviet army originally employed AK and AKM rifles, fitted with detachable sound suppressors (silencers) and loaded with special versions of 7.62x39 M43 ammo, known as 7.62x39 US (Umenshennaya Skorost – Low velocity). To achieve subsonic velocity along with acceptable ballistics, these cartridges were loaded with heavier bullets, but their performance was still inadequate. So, during the late 1980s, soviet designers developed improved sub-sonic ammunition, suitable for specially designed automatic weapons. 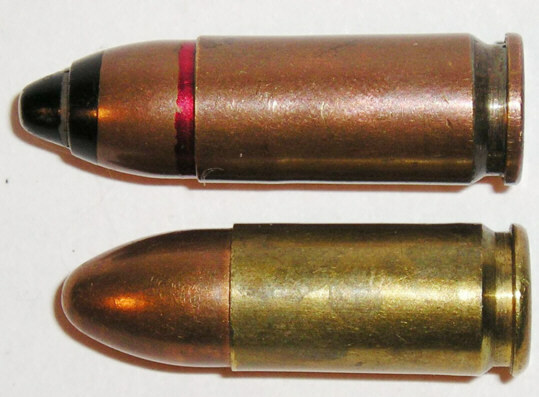 These cartridges, known as SP-5 and SP-6, were based on a 7.62x39 M43 case, necked-out to 9mm, and loaded with heavy, streamlined bullets. The SP-5 cartridge was loaded with a standard “ball” bullet with lead core, and was intended for accurate sniper work out to 300-400 meters. The SP-6 cartridge featured an armour-piercing bullet with a hardened steel core, which could defeat typical military-type body armour at ranges of up to 300-400 meters. Two weapons were initially developed for this ammunition, both based on the same receiver and gas operated action – the VSS sniper rifle and AS assault rifle. Both weapons have selective fire, with integral sound suppressors, and use the same magazines of 10- or 20-round capacity. Later on, several more weapons were developed for 9x39 ammunition, such as SR-3 and 9A-91 compact assault rifles, used by elite Internal Affairs Ministry, Police and State Security units. The one problem, associated with 9x39, as well as with most other special purpose cartridges, is that such ammunition is usually quite expensive. An attempt was made during the late 1990s to produce a much cheaper 9x39 AP loading, designated PAB-9. This cartridge featured bullets with stamped (instead of machined) steel cores, as well as increased driving surfaces. As a result, accuracy was poor and barrel wear significantly increased, so this ammunition is apparently no longer in use. This development leads us back to pistol ammunition, but this time with improved penetration capabilities rather than stealth. The proliferation of body armor rendered most military pistols, with ammunition designs about 100 years old, almost obsolete. The one way to deal with body armor is to adopt smaller-calibre, high velocity bullets for both pistols and submachine guns. This gives additional benefit of flatter trajectory and reduced recoil, both beneficial for accuracy. On the minus side, the terminal performance of the small-calibre, lightweight bullets is somewhat questionable. After initial test and research, conducted from the late 1980s under the codename “Grach”, the Russian armed forces adopted an improved version of the world’s most popular pistol ammo, the 9x19 Parabellum. First produced circa 1994, this version of the 9mm features an armor piercing bullet of proprietary design, and a powerful powder charge, which brings this cartridge, officially designated as 7N21, to the +P+ level, with peak pressures running up to 2,800 kg per square cm. The armor-piercing bullet of the 7N21 ammo features a hardened steel penetrator core, enclosed in a bimetallic jacket. The space between the core and jacket is filled with polyethylene, and the tip of the penetrator is exposed at the front of the bullet, to achieve better penetration. A bullet of similar design, but of lighter weight, is used in another service 9x19 cartridge, 7N31, which has been developed in the late 1990s for the GSh-18 pistol, and later adopted for the PP-2000 submachine gun. Another offspring of the ”Grach” trials is the 9x21 family of ammunition. Adopted by the Federal Security Bureau (FSB) of Russian Federation, this cartridge in its basic form, known as the SP-10, is more or less a stretched 7N21 cartridge with improved performance; the 9x21 ammo also available in AP-T (tracer) and SP-11 low-ricochet ball (with lead core) bullets. This ammo is used in SPS “Gyrza” pistol and in SR-2 “Veresk” submachine gun. The next line of development, almost unique to the Soviet armed forces, has been underwater firearms and ammunition for them. Initially developed during the late 1960s, underwater cartridges propelled the long and slim drag-stabilised bullets, and were used in four-barreled SPP-1 break-open pistols. 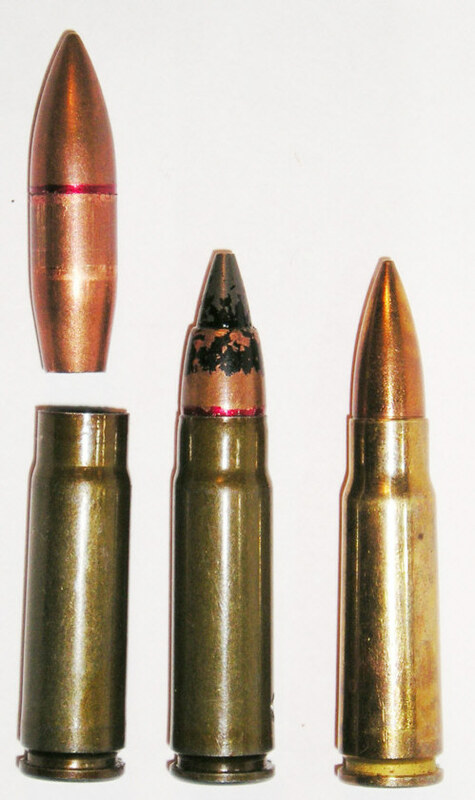 To achieve better loading and extraction, the bottlenecked brass cartridges were rimmed and loaded using special flat clips, which held all four rounds together. Both primer pockets and case necks were sealed against the water, and the steel bullets were covered by special lacquer coating. Initially satisfied with the pistol, Special Forces elements of the Soviet Navy requested further development and by the mid-1970s Soviet designers brought in a unique underwater assault rifle, the APS (which, in fact, was a smoothbore weapon). This weapon used cartridges externally similar to earlier SPS pistol ammunition, but based on the standard 5.45x39 M74 cases. This “rifle” ammunition is available in two basic forms, MPS “ball” and MPST “tracer”. Both APS underwater automatic weapon and SPP-1M underwater pistol are still in use by Russian navy, as well as offered for export. The last development which could be considered as “special purpose” took place during the 1970 – 1972 timeframe, when the KGB requested the development of an “easily concealable pocket pistol, with flat shape and not thicker than a matchbox (17mm)”. This pistol was intended as a concealed carry weapon for security personnel, as well as self-defence weapon for top ranked officials. After a short research designers rejected available western “pocket-gun” ammunition, such as 6.35x16SR and 7.65x17SR, as entirely unsatisfactory, and rapidly developed a small round, which looked more or less like scaled down 7.62x39 M43 cartridge. The 5.45x18 MPTs cartridge had a rimless bottlenecked case, made of brass, with pointed jacketed bullet. 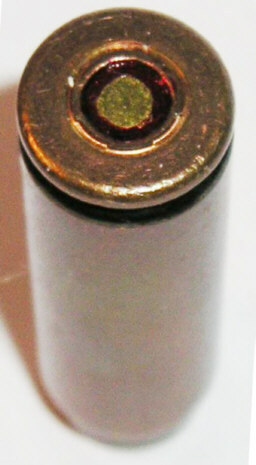 The terminal performance of this tiny cartridge is rather unspectacular, but it has a reputation for penetrating soft body armor at shorter distances. However, it is by no means “armor piercing” ammunition, and the later attempts to use it for larger PDW-type weapons such as full-size OTs-23 “Drotik” automatic pistol turned into a predictable failure. Still, the extremely compact and quite reliable 5.45x18 PSM pistol is widely used as a self-defence weapon for Army and MVD generals, as well as by various law enforcement operatives, working under cover. 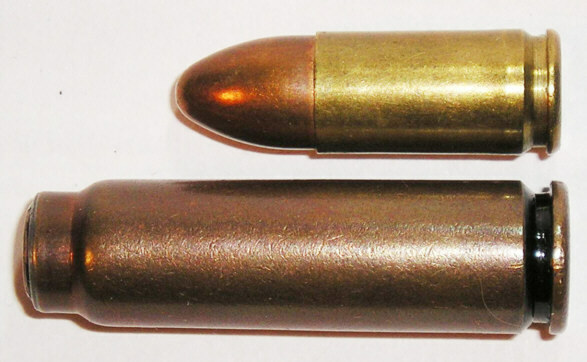 top view to SP-4 cartridges, left unfired, right – fired. Note the piston, locked at the right case neck; the conical pin is used to center the base of the bullet in the case. 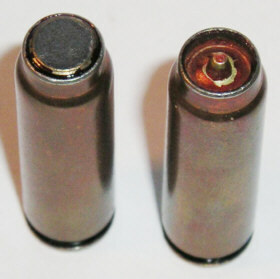 two fired 7.62mm PZAM cases loaded into steel clip, used for S-4M pistol.